As I have already described what are Arrays and their basic creation C code, in this post, we'll learn how to delete any element from any position from an 1-D array. Deleting an element does not affect the size of array. However, its necessary to check if the deletion operation is not outside the size of the array. For example, if the array contains 5 elements and you want to delete the 6th element, it won't be possible. 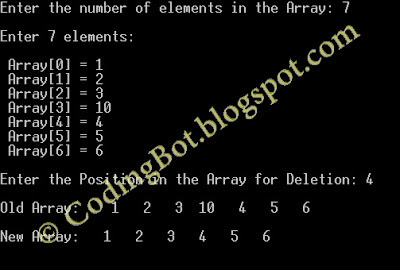 NOTE:- If you want to delete an element from any Array, then the total number of elements will be reduced by one, that is, you can say that the 'Deleted' Element will be replaced by other elements and the whole array has to be shifted. Please Comment If You Liked This Post ! !